Remove package, clean the vegetables with water. Cut into pieces and cook with meat or fish. Ingredients: Vegetable (Chinese Mustard) (50%), Water, Sugar, Salt, Preservatives (E211, E202) (0.025%). 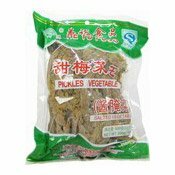 Simply enter your details below and we will send you an e-mail when “Mustard Green Salted Vegetable (甜梅菜芯)” is back in stock!